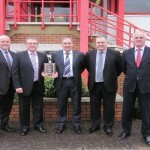 Pennine Pneumatic Services has earned the Atlas Copco Outstanding Performance Award for 2010. The companyâ€™s success as a distributor was attributed to the fact it is active across the full range of Atlas products. Based in Halifax, PPS has been offering customers a complete compressed air solutions package to help boost productivity and efficiency. The company also operates its own audit department to assess what each customer requires.